ANC secretary general Ace Magashule has told the media that he is considering taking legal action against journalist Pieter-Louis Myburgh over a damning book about his political career. “Let me not enter that space... you see I am worried, I’m considering going the legal route,” said Magashule when asked to comment on the allegations made in Myburgh's book. He was speaking at the sidelines of a special national executive committee meeting taking place in Irene, Pretoria, on Monday. The party is set to assess its state of readiness ahead of the elections, and its party lists. Myburgh’s book, Gangster State, unravelling Ace Magashule’s web of capture explores Magashule’s role in the Free State, where he served as longtime ANC chairperson and premier. Myburgh’s book accuses Magashule of using undemocratic means to hold onto power, nepotism, influencing how tenders and contracts were to be awarded. 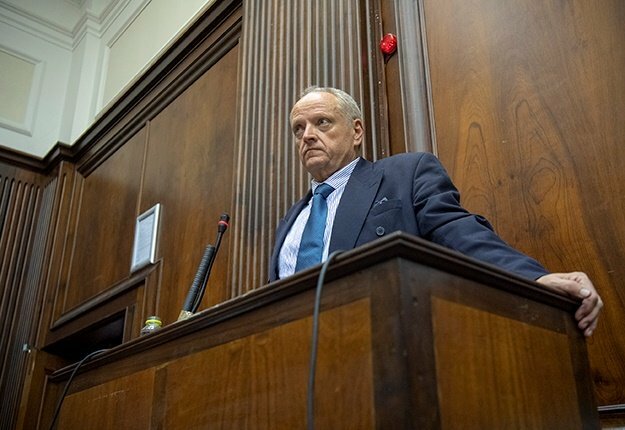 It also deals with his links to the controversial Gupta family, who have been accused of using their relationship with former president Jacob Zuma to loot the country, as well as claims of criminal networks. On Sunday, the ANC released a scathing media statement attacking City Press and the Sunday Times for carrying the stories, calling it a "clearly well coordinated, media attack". The party accused Myburgh of disseminating lies about Magashule. ANC acting spokesperson Dakota Legoete, speaking to journalists after Magashule had completed his door stop, urged Myburgh to take any evidence of any wrong doing by Magashule to the police. "We can’t be administrators of justice to declare someone innocent or guilty. If Myburgh has any evidence against Magashule, he should approach law enforcement agencies," said Legoete.